I love June, as June means the Edinburgh Juniper Festival. Returning to its home of Summerhall for the fourth time, the event is up there with the Whisky Fringe as one of my favourite boozy events of the year. From small origins, the festival has grown each year, with 42 gin brands exhibiting this year. Part of me as become slightly disillusioned with the gin industry recently, with too many quirky (i.e. rubbish) gins entering a saturated market place. But this year’s Edinburgh Juniper Festival has renewed my faith in the current drink de jour, with both old hands and new faces bringing some great tipples with them. Hailing from England’s industrial heart, the appearance of Manchester Gin at this year’s festival had an extra poignancy, as it’s bottle is adorned with the Manchester bee – a sign of unity and defiance in the face of recent terrorist attacks. Produced by gin lovers Seb Heeley and Jen Wiggins, the gin has great northern spirit at its heart with two of its 12 botanicals – dandelion and burdock root – foraged from the canals which once powered the city. Darnley’s have gone from strength to strength since I first tasted their gin at the first festival back in 2013. With their new Fife-based distillery due to come online soon, the company are continuing to innovate, with this Navy Strength twist on their already fab Spiced Gin. Using the same distinctive ten botanicals, the level of juniper has been boosted to ensure it cuts through the 51.7% ABV. I’ve really struggled with oak aged gins in the past, finding that they loose all their juniper influence, which adding the slightest hint of oaky sweetness. In other words, everyone ends up disappointed. 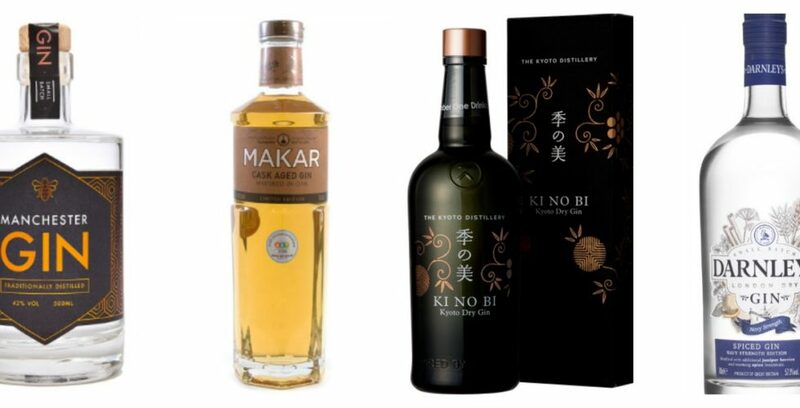 However, Glasgow’s Makar Distillery has manged to come up with not one but two successful oak aged gin. They are both matured in oak for just ten weeks, but his adds a good dose of sweetness and a wisp of smoke, whilst still allowing the juniper and citrus to also come flying through. And I managed to find at third fantastic oak aged gin! Released earlier this year to mark the famous Viking Fire festival, this bottling forms part of an increasingly impressive range from Shetland Reel. Aged in ex-whisky casks, the gin has an extra spark in the form of oaky notes and spices, whilst again allowing the juniper to present itself to the palate. My final recommendation comes from much further afield – Japan’s first gin distillery. It’s undoubtedly a dry gin but with a major Japanese influence. The botanicals, which comes from north of its home of Kyoto, include hinoki wood chips (Japanese cypress), bamboo, gyokuro tea from the Uji region and green sanshō (Japanese peppercorn) berries. Most notable, it also uses a rice spirit base, which makes comparisons with sake inevitable. And well deserved! Honourable mentions go to perennial favourites Edinburgh Gin Cannonball and Pickering’s Navy Strength, and future favourite Lone Wolf Gin, which I’ll have a lot more to tell you about later this summer. The juniper festival makes its way along the M8 next weekend, rocking up at uber-cool SWG3. So, if you find yourself in Scotland’s other city and at a loose end, then why not head along. And if not, be sure to keep your eyes peeled for details about next year’s festivals. You can find out more about the festival, its Glasgow leg and the other boozy events run by Solid Liquids on their website. My tickets for the event were provided by The Edinburgh Juniper Festival.